Where to find the essential regional Italian delicacies. Italy may be famous for its pizza and pasta, its espresso and gelato and tiramisu, but with 20 regions spanning a vast area from the snowcapped Alps to the sunbaked southern heel, the country is home to a range of cuisines as diverse as its geography. Here are a few standout regions and what’s cooking in each. In Veneto, as in other parts of northern Italy, pasta takes a back seat to polenta and rice. Polenta, made from ground corn, is a quintessential peasant food, while rice is a versatile base used across the region, served with duck and game in the plains and mountains, and with every type of seafood in the coastal areas. Rice is gently stirred into broth for risotto with a light consistency closer to soup, and then mixed with whatever can be pulled from the lagoon – calamari, scallops, spiny langoustines, red mantis shrimp, or even moleche (tiny soft-shell crabs available only in spring). 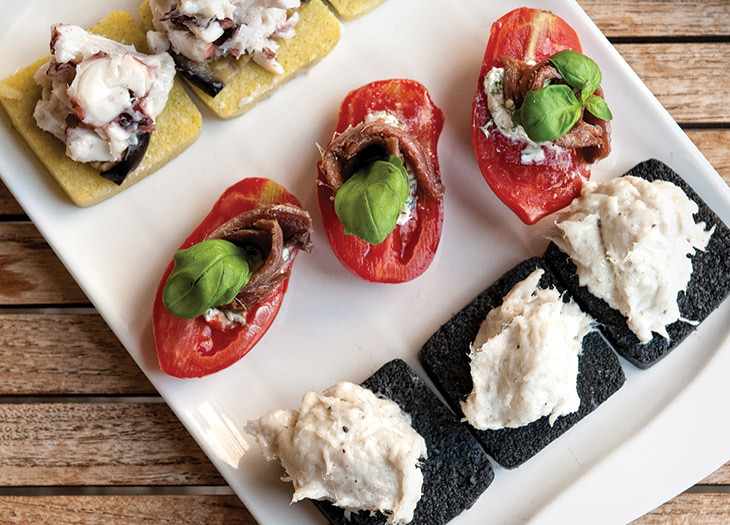 Even the style of dining is different in the former capital of the Venetian Republic, where lunchtime and aperitivo can be spent hopping among bacari, small stand-up bars serving Venetian-style tapas, called cicchetti. You’re never far from the coast in Liguria, the narrow northwestern region whose dramatic coastline is synonymous with the Italian Riviera. So it follows that the local cuisine looks to the sea, with fritto misto (a mix of fried seafood) varying from place to place, and from day to day, depending on what the fishermen haul in. But what grows locally – basil, and lots of it – is also used, primarily to make pesto. The best versions are made by hand with a mortar and pestle and tossed with freshly made trofie, a small twisted pasta native to the region. Even those who have never heard of the wealthy Emilia-Romagna region are likely well acquainted with at least one of its celebrated products. Perhaps it’s Parma’s famous Parmigiano-Reggiano cheese or its prosciutto di Parma (sometimes called Parma ham). Maybe it’s Modena’s aceto balsamico (the pinnacle of balsamic vinegars). Or Bologna’s mortadella sausage (not to be confused with deli-counter baloney). Ragù, the dish that inspired spaghetti Bolognese, hails from Bologna, where the rich, meaty sauce is served atop soft ribbons of fresh tagliatelle, typically made by hand with egg yolks that impart a sunny yellow hue. The tradition of la cucina povera (literally “the poor kitchen,” or peasant cooking) was born in times of scarcity, when putting a meal on the table required ingenuity. In Tuscany, that meant anything available was used to feed the family. This rustic comfort-food cuisine is still being cooked in most Tuscan homes, but you’ll also find it in the classic osterias and trattorias across the region. In recent years, la cucina povera has enjoyed a fashionable resurgence, with a wave of new restaurants serving typical Tuscan recipes alongside craft cocktails and natural wines, amid hip interior design. In Florence, the Tuscan capital long associated with its giant T-bone steak known as bistecca alla Fiorentina, la cucina povera is inspiring top chefs to creatively spin ordinary local ingredients – guinea fowl, white beans – into elegant tasting menus worthy of Michelin stars. Most visitors come to the ancient capital with one thing in mind: pasta. Carbonara, Amatriciana, and gricia are the “big three” – a trio of preparations riffing on a single base ingredient: guanciale. Guanciale is cured pork cheek (or jowl, depending on whom you ask), similar to pancetta, and Roman chefs mix crispy bits of it into an egg, black pepper, and pecorino sauce to make spaghetti carbonara. With tomato and pecorino, it forms the base for bucatini all’Amatriciana. And with just pecorino, black pepper, and a scoop of pasta water, it becomes rigatoni alla gricia. Vegetarians can fill a Roman holiday with delicious cacio e pepe. Literally “cheese and pepper,” the sauce is made of just that: pecorino Romano cheese and black pepper that meld into a velvety coating for pasta, usually spaghetti. The best-known Sicilian desserts involve sweetened ricotta, whether it’s whipped into a cream and stuffed inside a crisp tube of pastry (as a cannolo) or layered between thin slices of cake and draped with green marzipan (in a cassata). The sun-soaked isle is also fertile ground for growing nuts, which are churned into icy pistachio granita and creamy almond gelato, served not in a cone or cup but Sicilian-style, in a sweet brioche bun. Originally appeared in the November 2016 issue of Virtuoso Life.